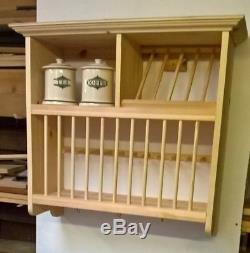 Hand Made Plate Rack in Solid Pine Construction. We use 20mm Thick Timber. Cornice Moulding around Upper Shelf. Lower Row Holds 12 Full Size Dinner Plates or a mixture of Side or Tea with rear plate slot. 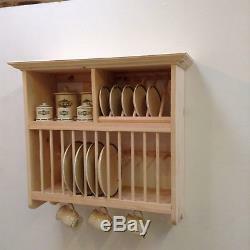 Top Row Holds 6 Medium Size Plates with a handy Shelf for Tea Coffee Spice Jars etc. Upper Shelf for the larger item. Under Lower Shelf 6 large Brass cup hooks. Dowels 13mm thick for years of use and 31mm spaces for Plates. Fully Assembled and Sanded ready for Finishing. Height 74 cm (29) Width 64 cm (25) Depth 24.5 cm (10). 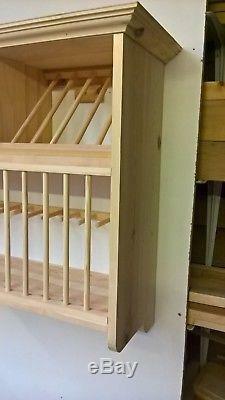 We have been making Bespoke Furniture for over 25yrs. Working in our own Workshop in the Heart of Devon. Plates and crockery not for sale and used for display purposes only. The item "Hand Made Crafted Pine Wall Mounted Plate Rack" is in sale since Tuesday, October 9, 2018. This item is in the category "Home, Furniture & DIY\Cookware, Dining & Bar\Food & Kitchen Storage\Racks & Holders". The seller is "cottagefarmpine" and is located in Holsworthy. This item can be shipped to United Kingdom.